A bristling half century from Riki Wessels and an inspirational debut performance from West Indies’ international Darren Sammy helped Notts Outlaws to a 15- run victory over Durham Jets in their NatWest T20 Blast match at Trent Bridge. Wessels scored 67, made from 41 balls, with four fours and five sixes, and he shared in a 100-run partnership with Samit Patel, who added 46. 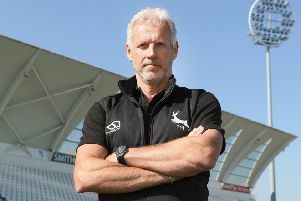 Sammy, who has joined Notts for a short four match stint, altered the complexion of the afternoon by removing Calum MacLeod and Paul Collingwood, when both were set, to claim figures of two for 31. The home side posted a competitive 175 for seven, after being invited to bat first, with Usman Arshad returning two for 19 with the ball. Durham’s response floundered after losing both openers cheaply and they closed on 160 for six, with Gordon Muchall finishing on 42 not out, although the visitors didn’t ever really recover from Sammy’s twin-strike in the eleventh over. When Notts batted at the start of the afternoon, Alex Hales, on his return from IPL duty with the Mumbai Indians, only made 7, before falling to a catch on the leg side fence. He’d hit bowler Paul Coughlin for six, in the same vicinity, just two balls earlier. Brendan Taylor was dismissed by a sharp reflex catch by bowler Arshad but that brought Wessels and Patel together and they applied pressure through the heart of the innings, especially to Ryan Pringle, who went for 19 in his second over. Wessels’ 50 came up from only 34 balls faced, an innings laced with a mix of sheer aggression and cunning improvisation. Patel became Coughlin’s second victim, lobbing gently to cover and then Keaton Jennings, on as the sixth bowler, induced Wessels to hit firmly to John Hastings at short third man. James Taylor was caught behind cheaply and Steven Mullaney was run out looking for a quick single to mid off but Sammy didn’t disappoint the youngsters holding up the ‘6 placards’ as he clubbed Hastings high over deep midwicket on his way to a quickfire 19. MacLeod and Collingwood rebuilt the innings with a threatening stand of 47 in six overs but then perished to successive deliveries from Sammy. MacLeod had made 32 but then top-edged the St Lucian to fine leg and Collingwood, who scored 30, was bowled trying to whip to leg. Hastings was unable to provide a muscular response, spooning Mullaney to point to give the bowler his fiftieth wicket in the T20 format. Pringle scored 25 from just 12 balls, in adding 61 for the sixth wicket with Muchall but the required run-rate had spiralled out of control by that stage and his dismissal by Fletcher, who took two for 29, meant 24 were still needed from the final over. Despite the loss, Durham remain top of the North Group, with 6 points from five matches played. Notts Outlaws have won two and lost one of their first three fixtures.